Abbreviations: CAP, Cellulose acetate phthalate; SKF, SmithKline French; NCR, National Cash register Company; ICI, Imperial Chemical Industries; TAP, Takeda Abbot Pharmaceutical Company; SR, Sustained release; LTI, Liposome Technology Incorporated. Means for the production and the design of refined controlled-release systems was advanced by the development of biodegradable polymers, the three archetypal polymers being poly(lactic acid-glycolic acid) (PLGA), poly(lactic acid) (PLA), and poly (glycolic acid) (PGA). Now there are many other polymers and copolymers that act as carriers for drugs. Lipid-based delivery systems, most notably liposomes, discovered by Bangham in the 1960s, led to the marketing, some 20 to 25 years later, of liposome-based doxorubicin and amphotericin products. The list of liposomal products is now impressive, but the gestation time was long as more was learned about the behavior of dosage forms in the body and about their stability, their interaction with proteins, uptake by the reticuloendothelial system, and extravasation, not to mention diffusion and uptake into diseased sites. Dendrimers, spherical or starburst polymers first synthesized by Tomalia and coworkers (7) in the early 1980s, are also now finding their niche along with a variety of other nanoconstructs, but the period from the first concept to the clinic is still proving tortuous. Many polymer micro- and nanoparticles have random polymeric internal and surface structures. So, in theory, the ability to synthesize dendrimers with their precise architectures and controlled arrangement of surface groups allows the practice of true molecular pharmaceutics, with precisely positioned ligands and other agents. In a relatively short period of time, pharmaceutics has moved from the macroscopic through the microscopic to the nanoscopic domain and from the more empiric to the more quantitative. It has long been intertwined with colloid science typically in relation to the formulation of micellar-solubilized products and the stabilization of suspensions and emulsions; the application of colloid science to nanosystems is more vital than ever, as discussed in chapter 12, volume 2. In many experimental systems, for example, with dendrimers (2.5 to 10 nm in diameter) and carbon nanotubes as vehicles for delivery, the drug has dimensions in the same range as these putative carriers. This is an inevitable consequence of the fact that not only have such dosage forms become smaller but also the average size of therapeutic molecules has grown with the use of more biologicals. New or reinvented approaches to the interactions between a carrier and a drug need to be applied. 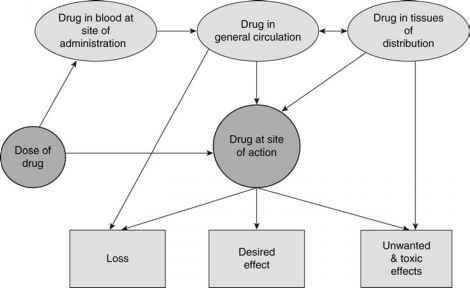 A deal of effort has been addressed to the topic of carrier-mediated drug targeting, perhaps at the expense of the physical, pharmaceutical, and technological aspects of the task, but there is a growing realization that the neglect of the fundamental physical aspects of pharmaceutics is a mistake. Particulate delivery systems once administered are placed in new thermodynamic situations, which we must model and predict and thus design products that are colloidally stable yet labile enough to deliver their loads and be excreted.